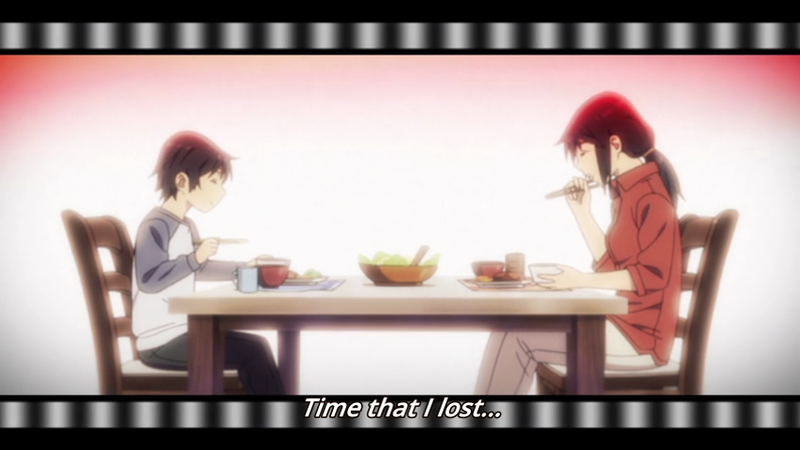 Have you been watching Boku Dake ga Inai Machi (or Erased, as it’s called in English)? It’s been an exceptionally good anime so far, so go watch it if you haven’t already. 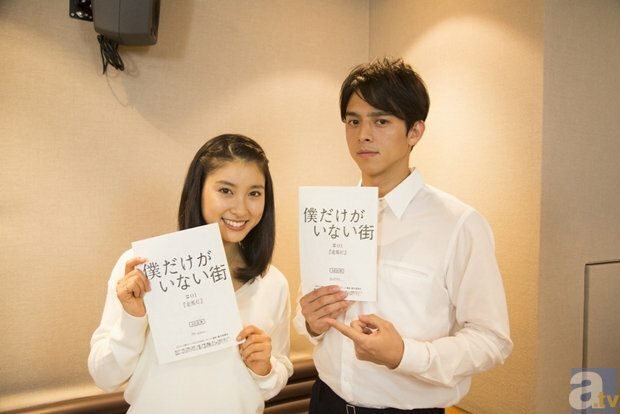 BokuMachi piqued my interest before it aired because the two actors playing the protagonist’s character, Shinnosuke Mitsushima and Tao Tsuchiya (shown above), are live action actors who have never had an anime role before. Normally, haiyuu (actors) and seiyuu (voice actors) occupy separate niches, despite the crossover in their skill sets. While it’s not unheard of for a seiyuu to have live action roles or for haiyuu to have anime roles, it’s still uncommon enough to be worthy of attention. Thus, I was extra curious to see how the BokuMachi anime would turn out, as I had the feeling that it would be a very off-beat and distinctive work. It was immediately clear from watching the first episode why the director Tomohiko Ito cast Mitsushima as the 29-year-old Satoru. The episode was carried heavily by internal monologues and was accompanied by very deliberate visual choices that emphasised the character’s isolation. Satoru was often depicted in shadow, or otherwise cut off from other people. 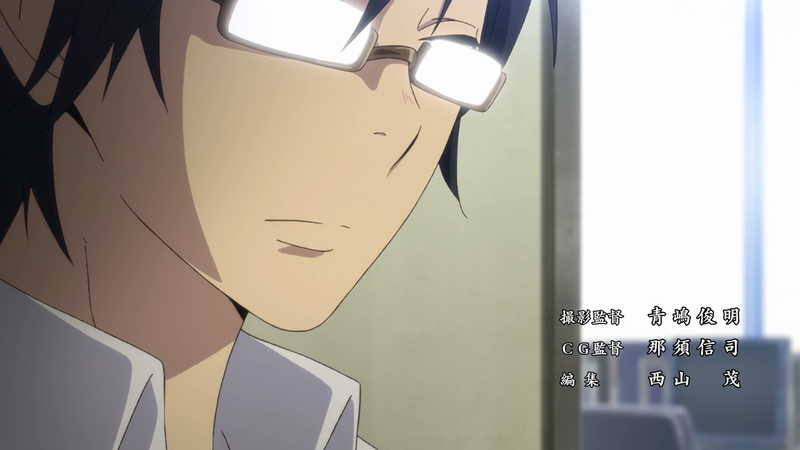 When his editor tells him that people can’t see his face through his manga, the scene cuts to a partially obscured view of Satoru’s face, his eyes hidden behind his glasses. These choices draw attention to the sound of Satoru’s voice, because visually he gives little about himself away. But Mitsushima keeps his voice subdued, making Satoru seem more like a real person onscreen than an animated character – and this must have been precisely the effect Ito was going for. Mitsushima remarked in an interview that the drawings he was exposed to in the recording sessions filled him with an extraordinary feeling that he could be his raw self with no frills attached (“なにも色付けしてない素っ裸の自分”). Perhaps in some cases, animation can inspire more realism than film because of the absence of a prying camera. Episode 2 shifts the focus of the story to Satoru’s 10-year-old self, voiced by Tao Tsuchiya. Satoru still has his adult memories, so his character poses a lot challenges for an actor. Mitsushima narrates Satoru’s thoughts, but something about his adult self-awareness must still be conveyed by his interactions with others as a child. He may have a child’s larynx, but not a child’s soul. If there’s one thing that strikes me about Tsuchiya’s performance, it’s that it sounds somewhat unrefined, a little rough around the edges. It feels as if she had difficulty carving out a voice for herself. She was evidently under much more pressure than Mitsushima, not only because she plays a greater role in the anime, but also because she can’t act as herself in front of the mic. She must deliberately put on a voice that is not hers. Tsuchiya has never played a young boy’s role before, and it shows. Of course, neither Mitsushima nor Tsuchiya could have succeeded as well as they have without a cast of veteran seiyuu to support them. Voice acting is a specialised art that requires particular attention to breathing and projecting one’s voice. A cast of non-seiyuu would have faltered from their lack of experience, regardless of how fitting their voices were. In BokuMachi, we have the veteran actress Aoi Yuuki playing the main heroine Kayo. She’s as impeccable as ever, in spite of her limited number of scenes so far. Special mention must also go to Chinatsu Akasaki, who shone as the peppy Katagiri. Most experienced seiyuu can do down-to-earth roles when they want to, which they did here. To their credit, they never took the spotlight away from the protagonist and his introspection. 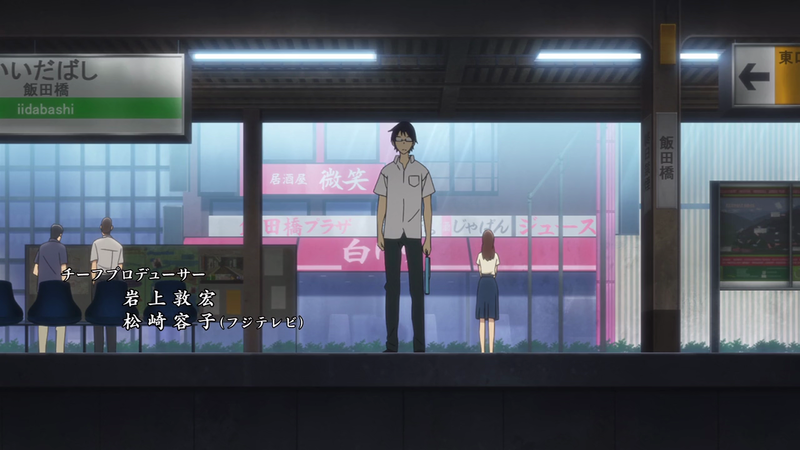 Overall, there are many reasons why BokuMachi is a great anime to watch: the detailed character animation, the confident visual and sound direction, the gripping plot. The voice acting is a nice touch that demonstrates the staff’s willingness to get all those little details right. It’s easy to miss the subtle nuances at first glance, but if you found yourself engrossed in the atmosphere, then the voice actors did their job right. When I finished reading the original manga, I was completely shaken. The darkness residing in people’s hearts is so deep and heavy. Yet in the midst of that darkness I could feel a gentle light flickering desperately. It had a warm, nostalgic touch. Many of the things depicted in this story are sad and cruel and can never be forgiven. But that’s also the reason why I want to face it sincerely and capture it honestly through my acting. In my opinion, an anime voice-acting role is a weighty responsibility. Although I’m happy, I’m incredibly nervous at the same time. Try as I might to catch up to Satoru in the 2D world, he remains so far out of my grasp, and that leaves me agitated. Nevertheless, as I endeavour to learn all the necessary techniques, I want to be like Satoru and take every hardship stoically without ever giving up. Frankly, when I received the offer, I was happy. I have a lot of interest in the voice-acting world, so I’m very excited. When I read the manga, I was surprised at the extent to which Sanbe-sensei was able to spin such a suspenseful narrative filled with so much heart about a run-of-the-mill boy protagonist. “If I had made a different choice that day, I wonder how my life would have turned out,” is something that everyone has felt before, but it drives his every action. It’s the kind of work that catches you unawares in your daily routine and makes you reminisce about the past. With the help of the wonderful staff and every fellow voice actor, I’d like to create a work of art that touches everyone’s hearts. The role of Satoru Fujinuma is not that of a hero but that of someone who escapes. I looked for people who could fulfill that role and came upon two names. I couldn’t feel much anger from Tsuchiya-san even when she strained her voice, and I thought that part of her was very much like Satoru. It was the sort of performance that evoked a defeatist attitude. I also think that she had a good balance when it came to sounding like a child. As for Mitsushima-san, he’s done a lot of narration and commercials along with his wide breadth of acting roles, such as his live-action films and so on. Satoru is a character who performs a lot of monologues, you see. I’ll consider it a big success if people can connect Satoru’s growth as a character with what the two actors came up with in the recording sessions. I’m looking forward to the payoff. 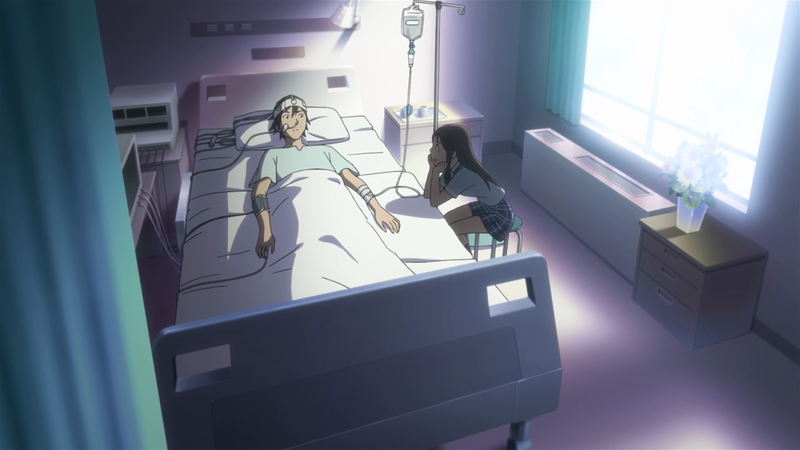 Posted on January 15, 2016, in Anime Analysis and tagged boku dake ga inai machi, erased. Bookmark the permalink. 19 Comments. Sorry, can’t hear any complexity in kid Satoru’s voice, not with the rest of the cast (adult Satoru included) doing such an outstanding job. And it should be there, really. What we have here is an adult playing himself-as-a-kid, not “a vulnerable boy who is wise beyond his years”. Hmm, I think I can agree with you that Tsuchiya was the weakest voice in the cast overall, but I still think she did a great job as the young Satoru. I also think that Satoru is depicted as a vulnerable kid, because even though he has his adult memories, he’s still so powerless in many ways and he knows it. You might argue that he’s putting on a role for others so that he blends in as a kid, but the simple childlike delight on his face when he saw his mother again was not faked. I think this highlights the point that even though he grow older past this point in his life, he never truly grew up. I have no idea what the philosophical concept of “truly” growing up means to you in particular, so I can’t discuss that, but man, he was not delighted at seeing his mother, he was delighted at seeing his mother /alive/. There is nothing childlike about that at all. Childlike was probably a bad word to use, so… how about vulnerable? Unguarded? He definitely didn’t come across as an adult in charge of his own life. I can agree to that “not in charge of his life” part, and doubly so. Good luck trying to stay in charge when your parent gets murdered out of the blue and seconds later you are ripped out of your body for a small time jump. A level of tension adequate to the above condition is reflected in the adult acting and animation – take the 3:10~3:40 part. The child voice, on the other hand, is just that: an insecure and vulnerable kid. Not an adult in a child’s body barely suppressing his turmoil while expressing himself through young vocal cords. I’m expecting a lot, yes, but the rest of the cast are pulling through, so why not. Tsuchiya’s acting isn’t outright bad (like Kaze Tachinu or something). When we get Satoru’s gut reactions and him talking honestly, that vulnerable child voice is adequate. When Satoru plays friends with people 18 years younger than him… that kind of plain acting really leaves question marks. We’ll see if the show can sell this balance in the remaining episodes. Maybe Satoru’s younger brain is affecting his emotional responses more than he is aware off. In this case, it is the adult narration that becomes somewhat questionable in turn. It might be a mixture of the two. We’ll see. Frankly I’m also having a little head theory after episode 2 that child Satoru is influenced both by his mind AND his body. His personality will be the result of the interactions of these two things, because after all, whatever his memories, his brain is still sitting in an 11 years old’s body, with all the brain and hormone chemistry that implies. I thought of this when he blushed after Kayo touched his hand – and he seemed surprised at himself. I think there’s two forces at play there – his own adult rationality that is above being shy around a childhood crush, and his young self’s instinctual and physiological reactions that are still the ones of a kid. Isn’t the manga still ongoing? Interesting comments from the voice actors! I thought the voice acting was pretty good in BokuMachi as well, but then, I really like pretty much everything I’ve seen and heard so far. Yeah, everything about the production is just so polished. It’s a real winner. It’s possible the Boku Dake manga could end in tandem with its anime, similar to what happened with the Your Lie in April manga. I’m interested if the live action movie version (releasing March 19) can also successfully follow in the anime’s footsteps. It won’t lack for star power – Satoru will be played by Fujiwara Tatsuya ( L from the Death Note movies, Shishio from Rurouni Kenshin). Yes, I’m interested in the live action movie as well. It’s hard to imagine it’ll be better than the anime, but it is the sort of story that is well-suited to live action film. Omg, i had no clue the voice cast for this anime were so pretty lol, i thought they would be older for some reason. They certainly are very good-looking! Then again, they are live action actors, so I expected them to be attractive. In case you were curious, Mitsushima is 26 and Tsuchiya is 20. Nice article you have wrote here.. I am impressed to read this article. Thanks for sharing this great information..